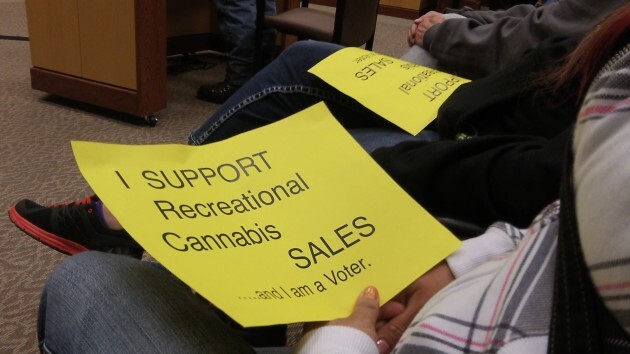 Remember the days, like this one in 2015, when the Albany council was still debating whether to allow recreational marijuana sales? The council said no, but city voters said yes in 2016. Albany has received its first share of the state tax on recreational marijuana. It was for $185,244.86, which is a nice chunk of change, though not perhaps the giant windfall that advocates of legalizing weed had imagined. Finance Director Stewart Taylor told me the city got no detailed accounting of what the money represented or how the amount was calculated. All it got, he said, was the deposit of that amount on Wednesday. When voters approved recreational cannabis sales in Albany a year ago, the measure they passed also included a 3 percent city excise tax. But it sounded like the tax revenue the state distributed this week was made up only of the state’s 17 percent sales tax on marijuana. Statewide, the Revenue Department handed out $85 million — with 40 percent going to schools, 20 percent for mental health programs, 15 for state law enforcement, 10 percent to cities, another 10 percent to counties, and 5 percent to prevention of drug and alcohol abuse. Of the state tax collected before July 1, 2017, cities and counties got their share based on population. Money collected after that date was distributed to cities based on population and the number of pot licensees, and to counties based on population, the “total available grow canopy size,” and number of licensees. Is there a generic Levitra available? On BantuHealth available http://www.bantuhealth.org/levitra-generic-buy/ quality generic Levitra at cheap prices. Albany had not budgeted for the revenue, and so it was added to the city’s equipment replacement fund, in effect a reserve, City Manager Peter Troedssen told the council Wednesday night. But even if the pot tax won’t satisfy the finance-types, a perverse incentive system is now in place. On the one hand the city is addicted to the new revenue and wants more. On the other hand the city wants to reduce consumption through the tax, meaning less revenue for the general fund. Any bets on which motivation will win? I wouldn’t be surprised to see a city-wide “smoke more pot” marketing campaign in the near future. Put a billboard next to the merry-go-round so future sources of revenue will be properly indoctrinated. Considering that there are only what…two places that sell weed in Albany, $185,244.86 is a nice chunk of change. That’s roughly $46k per business, pretty nice return for the city from small business. Please read the story. The amount is based largely on population. Still trying to find out how much if any is the local tax. Albany’s Canna Kitchen does not dispense. Gramsterdam did, but does not now. We do still have our medical clinic, for those who would like to get our renew your card, please call us at 541-981-2620. We’re open Monday – Friday 10-5 and Saturday by appointment. We schedule clinics weekly. Thank you! I suggest that neither Councilor Kellum or Councilor Johnson be allowed to vote on the use age of any revenues collected on sales of pot. Both of these folks voted against the initial will of the citizens of Albany in the original legalization-of-recreational-sales authorized by the 2014 ballot measure. At that time, neither of these two had any interest in the economic benefits provided by recreational sales. That either of them should have any say in how the cash is spent serves only to highlight their insincerity and hypocrisy. Let those leaders who demonstrate vision be the leaders to direct the dollars. Maybe said local pols can be “excused” prior to any discussion/vote on these revenues. Why would we want anyone in office unwilling to represent the people that elected them. We have two names. Vote accordingly. To clear any confusion, I was simply making a reference to this story off paper’s website where there was an excusal of members. The report was misleading in using the word “excused.” The council members were absent and their absence was excused as opposed to unexcused. It is more than slightly amusing and highly illuminating….It being Hasso’s parsing of, or perhaps Hasso is simply regurgitating government jargon, but there is….somewhere in the lower pits of Albany City pro forma language, a paragraph or two delineating the difference between an excused and an unexcused absence, the former apparently being OK while the latter a No-NO. No doubt the language passed the City attorney’s legal muster. Iit would be beneficial to to know what constitutes excused and unexcused absence. Elected officialdom, with the exception of felonious activity, is only answerable to their constituents at election time, What possible difference and what possible consequences are there? It rings of political horse-puckey. Given the vagueness, the question must be asked. Commenter hj annoy asks the most salient question. How close to the start of any Council member, a member who perhaps does not wish to be exposed in a public vote…how close to the meeting start time can the wary Councilor call-in and bail out. When do Council members read the agenda for the evening sessions? And who decides the excuse/unexcused choice? John Hartman and Judy Bailey, Kellum and Johnson had no clue how the citizenry would vote before the election. They also had no idea what kind of revenue would be brought in. Their concerns about the health and welfare of it’s citizens was and is valid. Also considering marijuana is still classified as a Schedule I drug, which means the Federal government views cannabis as highly addictive and its use against the law. They were doing what, to most, would be considered due diligence, not knowing what the Feds may still choose to do. What possible difference does it make whether Kellum and Johnson knew how the vote was going to go. If that is true, then Kellum and Johnson must have already decided to vote to thwart the will of the people. Almost conspiratorial. What possible difference could it make if Kellum and Johnson didn’t know how much tax revenue might be involved. That is not germane in any way to their decision to ignore the electorate. Besides, the 3% City Sales tax passed in 2016. The original ballot measure creating a legal cannabis market run by the State passed in 2014. This is the measure that Kellum and Johnson didn’t like and so they voted to ignore the people. If Kellum and Johnson are “concerned” about the health of the citizenry, then they ought to have closed liquor stores, fast food restaurants, pizza emporiums, saloons, etc when the took the vote to ban recreational sales.